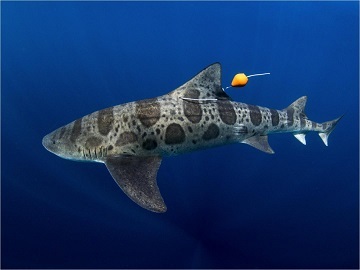 A leopard shark with a reusable tagging apparatus, used to track the shark’s swimming pattern. Credit: Kyle McBurnie. In a recent experiment, researchers tested this hypothesis by capturing, tagging, releasing and tracking 26 leopard sharks along the coast of La Jolla, California. Before letting the sharks go, the scientists put cotton balls soaked in petroleum jelly into the noses of 11 of the 26 sharks to temporarily weaken their sense of smell. (The cotton later disintegrates and does not hurt the sharks.) Then the scientists released all of the sharks about 5.5 miles off shore and tracked where they swam for the next four hours. The sharks without the blocked noses swam more than a mile in relatively straight lines and ended up about 63% closer to shore than where they had been released. But the sharks who couldn’t smell well were only 37% closer to shore—and did quite a bit of meandering. Even after the scientists accounted for the influence of ocean currents, the sharks with the stuffed noses swam pretty tortuous paths toward shore. The researchers suspect these sharks use smell to help them navigate by sensing changes in the chemical composition of the water. Of course, if the change includes scent of their prey, the shark may make it home just in time for dinner.